Discussion in 'Property Tours' started by Paradise725, Jul 21, 2016. 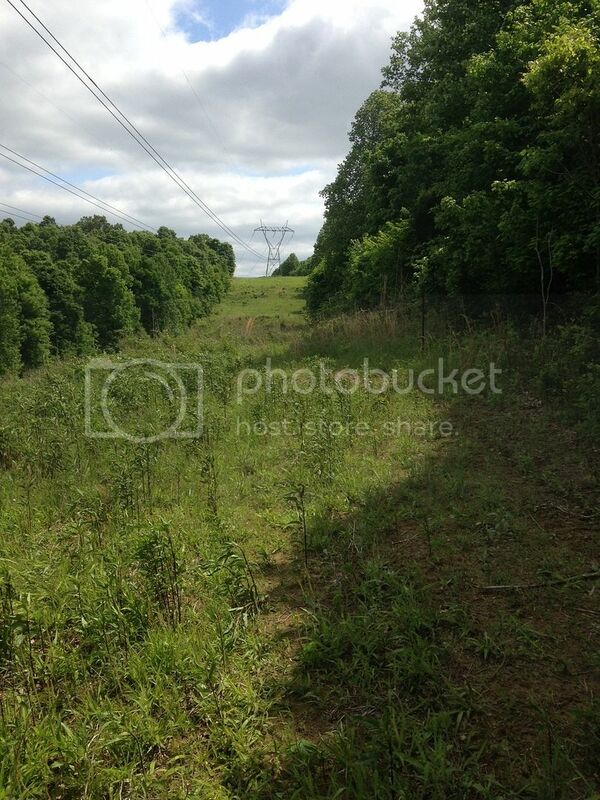 400 acres of the property was clear-cut in mid-1990's, so tree stand locations are limited on the back half of the farm. 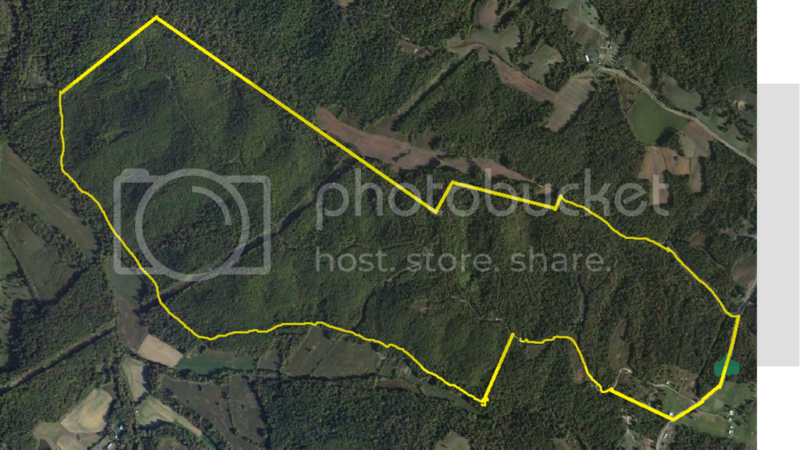 At the recommendation of many happy customers from the QDMA Forum, I had Steve Bartylla do an aerial property evaluation for me this winter, which I started implementing this spring. My goal is to be able to harvest 2-3 bucks 4.5 years old or older from the farm every year. This is a lofty goal based on my past hunting success (or lack thereof), but I am blessed to know from my trail camera surveys that there are multiple mature bucks using the property regularly. It is my hope and expectation that implementation of Steve's property plan will result in higher-odds stand setups and lower impact hunting, both of which will improve our chances of killing mature bucks. Stay tuned for more updates as time allows. Thanks for following along! Gator - you serious about moving? We hunt on a lease in Butler County, KY on the Green River. 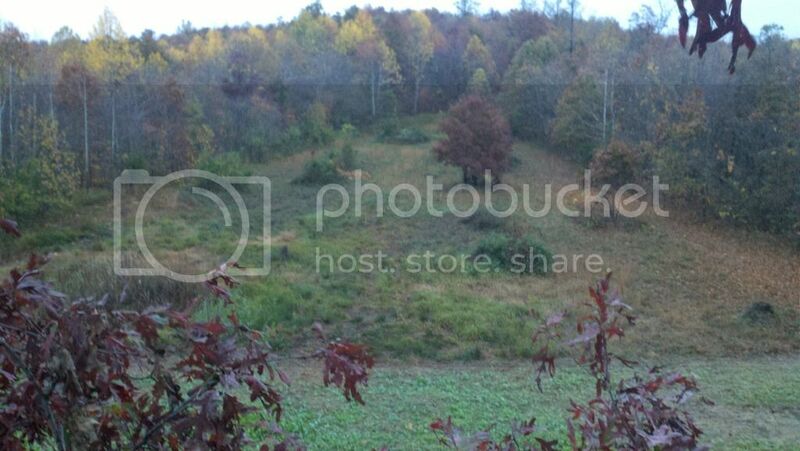 I have hunted on leases in Logan County and Edmondson County. Central and Western Kentucky have some great bucks. 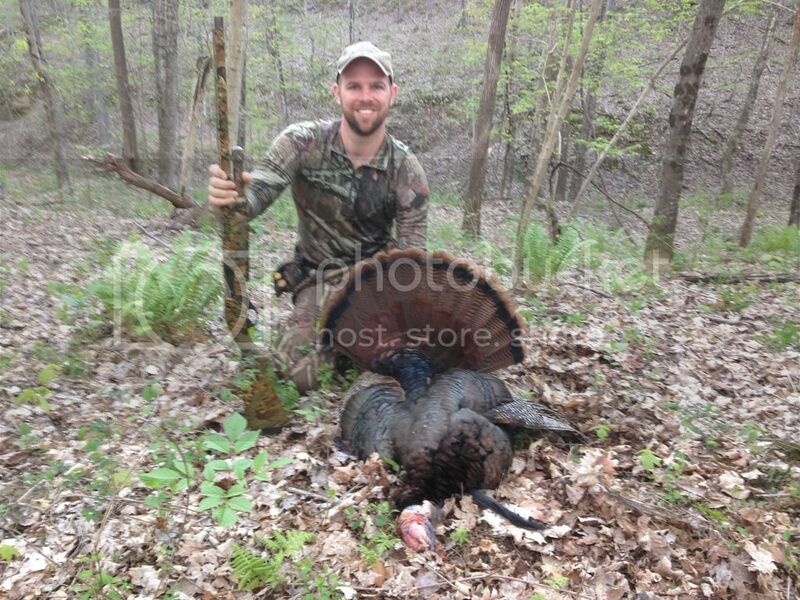 I just don't have any time on the ground in Eastern KY.
His 725 is a farm that would hunt larger than its size. His habitat plan will improve that farm greatly. Awesome looking piece of ground! I am not a land management guy but am a serious hunter that seeks to consistently kill mature 5.5 to 6.5 year old bucks and I am sure we can share some hunting knowledge on those big old boys we are after. How did you add that image and what format is it in? 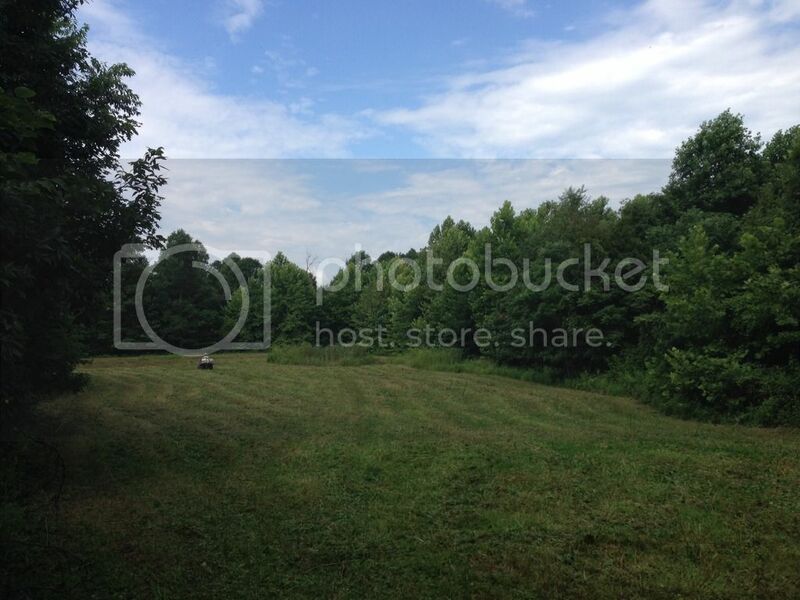 I am having trouble adding an image of one of my farms. Was going to post it to give some guys something to play with while waiting for the big hitters to get their threads started. Download google earth and you can add boundaries and save them on there. Interesting, I use to own in Butler Co. I still have a buddy whose family has land in Butler Co, on the Green River. Anywhere near Reed's Ferry? Wow, 725 acres, I would love to manage a piece of ground like that. We are in Jetson which is on the eastern side of the county - we cross the river at Aberdeen and head east toward Edmondson and Warren County. Recently had a good camera pull. We need a crop of acorns to make each year or the good bucks don't stay on the farm as well. I will have to look up the ferry you mentioned. I have the image on my photobucket.com account. While viewing the image on photobucket, there is a box on the RH side that you can click to get a "direct" link to the photo. Next, I click the "Image" button at the top of this text box and paste the link into the box that pops up. Give it a shot and let me know if you have any trouble! Zuke, Yes it's a blessing to have access to this much ground. I'm a lucky dog but I guarantee I face many of the same challenges as people hunting smaller properties. Sometimes it seems like it would be easier to have FEWER options! I shared this story on a separate thread last year after I killed him, but I wanted to show you guys where I had pictures of this deer versus where I actually killed him. 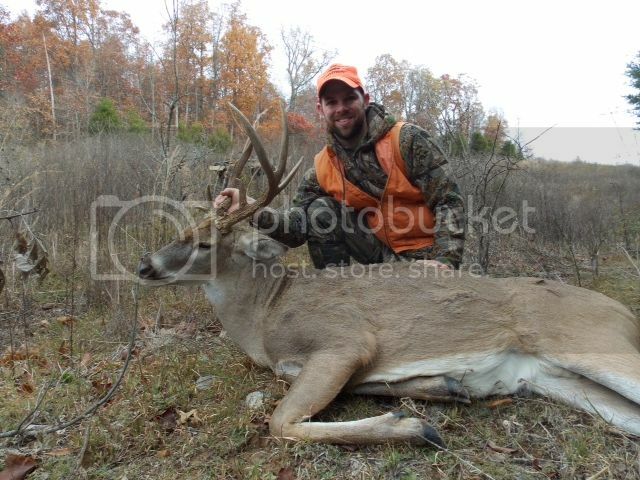 I got pictures in 2011 of this buck at the red star. I had him on camera consistently during the month of October, but never saw him again until fall of 2013. 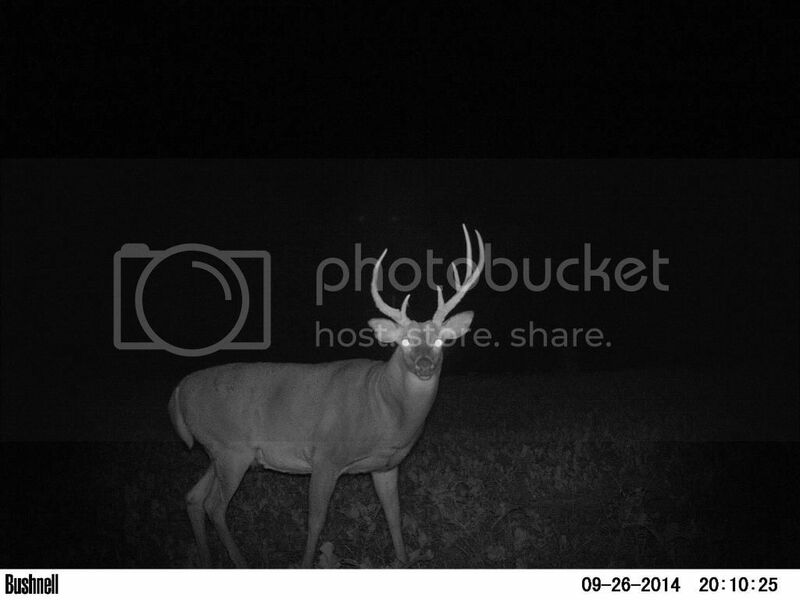 I got pictures of him regularly in my food plots at the yellow stars throughout the fall of 2013 (always at night). For reference, the straight-line distance is 1.1 miles between the two yellow stars. 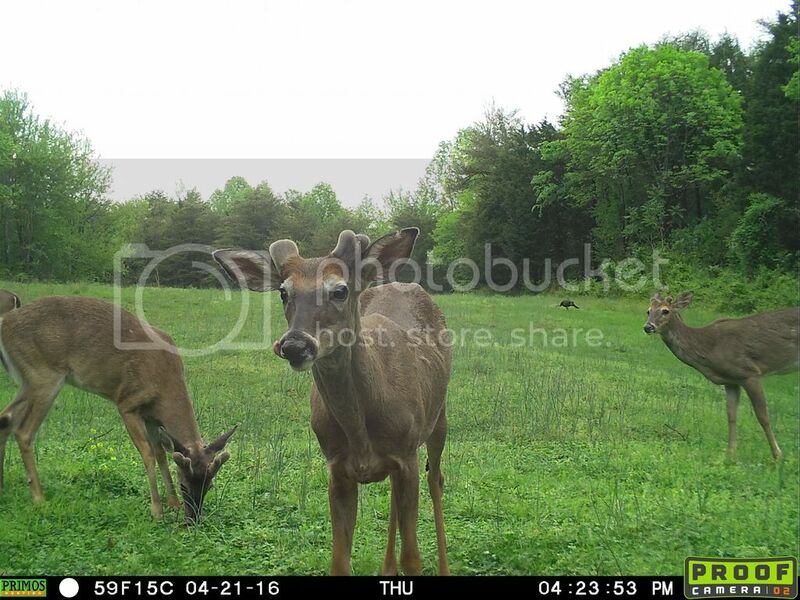 I put in a food plot on the powerline at the pink star in fall of 2014, and there he started showing up very regularly, including during daylight. I first laid eyes on him in early November during bow season as he cruised through the powerline foodplot at 2pm in the afternoon, 100 yds from me. Two days later, (opening day of rifle season), I caught sight of him tending a doe in the thick brush 150 yards down the powerline from me. I ended up killing him there (blue star). Just wanted to share with you guys one of the projects that I've done to improve the hunting on my farm. 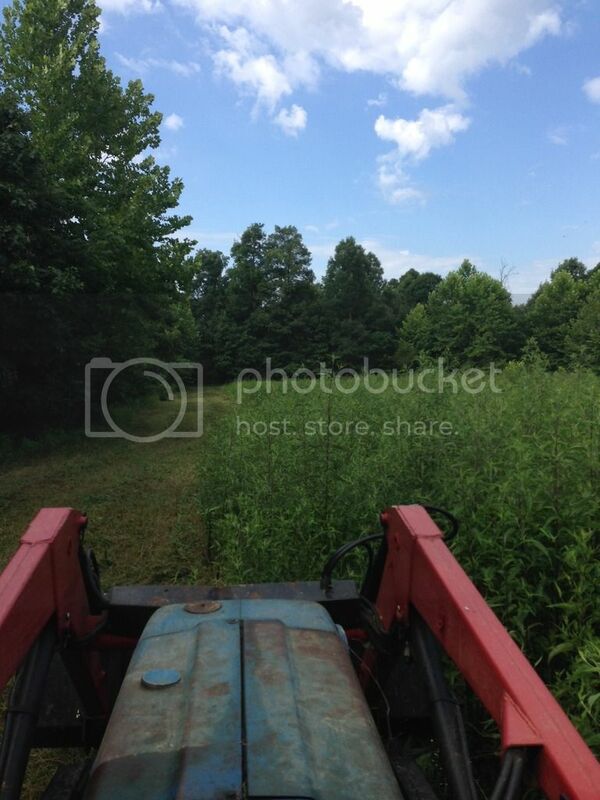 The back half of the farm was clearcut in 1996. The KDFWR biologist had the loggers leave scattered white oaks along the main ridge and finger ridges to help re-seed the area. As a result, the only trees large enough for tree stands on the back half of the farm are either down low right along the property lines, or up high on the ridges. We knew we were under-utilizing the back half of the farm, but there simply were very few available locations for tree stands. I don't enjoy hunting on my neighbor's fence, so I decided to take matters into my own hands and create a hunting setup on one of the finger ridges. I selected a finger ridge toward the back of the farm that we call the Logyard because it had a clump of 4-5 large white oaks adjacent to a flat section that would be perfect for a food plot. My grandfather, who owns the land, keeps a small JD 350 dozer on the farm to help with access trail maintenance and repair. He originally bought the farm for us to horseback and atv ride on, but I have since re-purposed it almost exclusively for hunting. As a graduate student in 2007, I was able to dedicate a full week during winter break to clearing off the log yard and prepping it for a food plot. I enlisted the help of a good friend and hunting buddy, and proceeded to make a mess. 1. We did no research or study of any kind as to the best way to clear 15 year old trees. While I ran the dozer, my buddy started cutting trees on the other end of the planned plot. It wasn't until he had cleared 1/3 acre that we realized we had just made it much harder on ourselves to push the stumps out with the dozer. 2. I did not know how to run a dozer. Actually, I knew how to operate one mechanically, but did not have the skill of a dozer operator. Someone who knew what they were doing could have probably made short work of our little project. We just made a mess. I won't go into much detail, but let's just say that our ~1 acre food plot probably took 200+ man-hours (imbecile-hours more like it) to get into condition to plant the fall of 2008. 3. I didn't have a plan other than I knew what tree I wanted to put my tree stand in. I didn't think about where I wanted to put all of the trees I cut down and pushed over. I didn't think about how I wanted to access the stand or whether it was supposed to be a morning or evening stand. I was the very definition of an amateur. So, nothing groundbreaking here, but wanted to share a story of part of my management journey. I guess the lesson for me here was that you can do a lot of things wrong and still come out with nice looking results that produce meat for the freezer and many hours of enjoyment watching deer and turkeys. 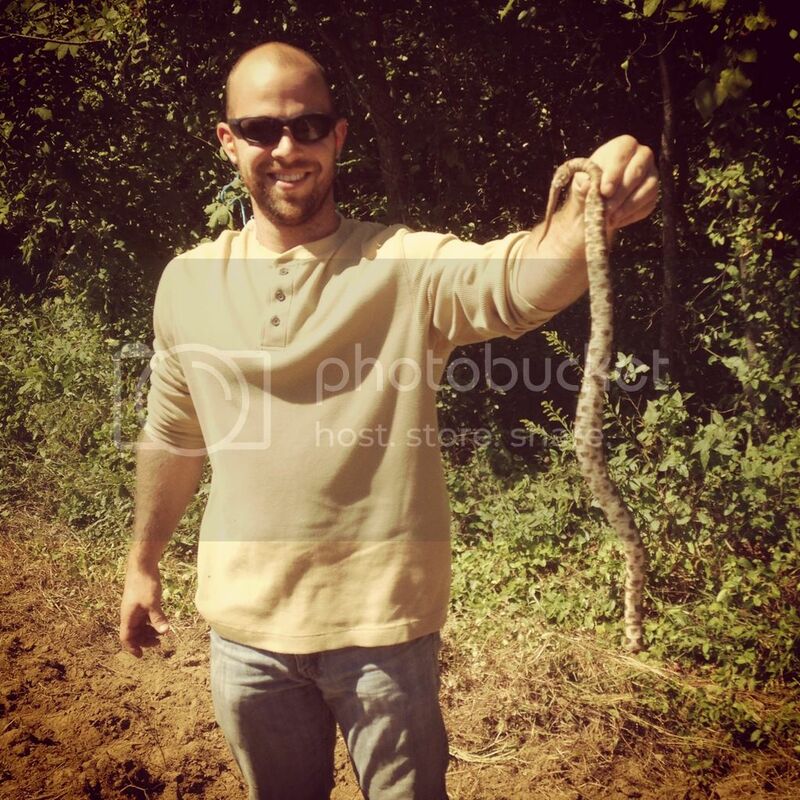 A couple of my buddies went shed hunting at the farm this weekend and had some pretty good luck. My primary winter food source was all consumed by early February, so I wasn't too optimistic that we would find fresh sheds. 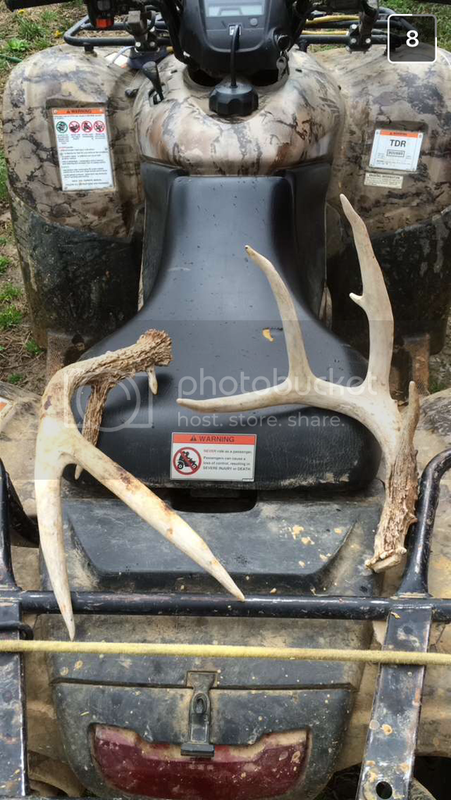 As luck would have it, they found two nice sheds... but both from years past. The 4 point side with the kicker off his G2 was from last year, and the 3 point side with the kicker off the base was from 2 springs ago (I killed that deer fall of 2014). Gotta love it!!! 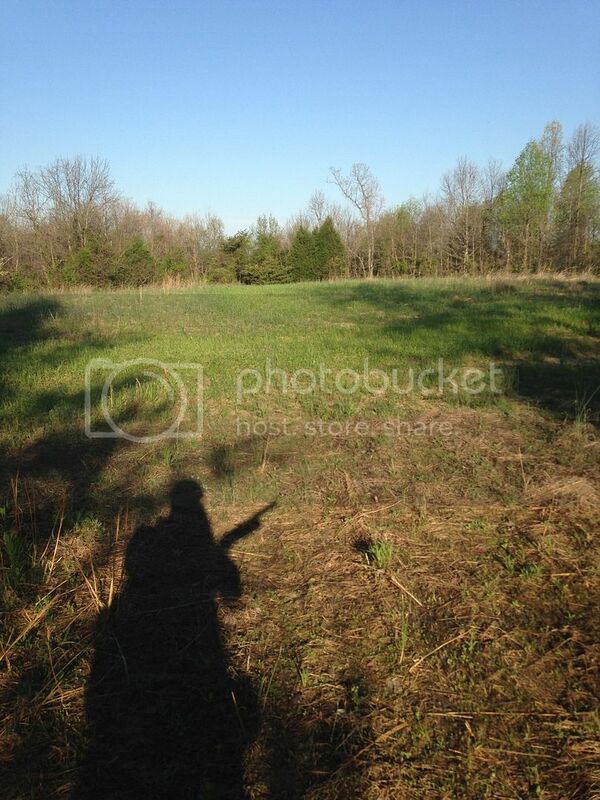 I made it up to the farm last weekend for the turkey season opener. I hoped to get lucky Saturday morning first thing and have the rest of the day to work on implementation of Steve's plan, but things didn't work out that way. I set up on a couple of gobbling birds first thing and when I called them in they turned out to be jakes. Things got real quiet after that and I hunted until 1pm with no luck. My buddy and I also got about 75% of the edge feathering around the log yard plot completed per Steve's plan. The biggest change this year is using the perimeter access, so we spent a good chunk of time getting the south side perimeter access trail in decent shape. That turned out to be a little more time consuming than we thought, so the only other project we had time to do was to take soil samples on the plots. I made a homemade soil sample tool with a piece of PVC pipe and a broom handle that actually worked quite well. Sunday morning was a different story in the turkey woods as I got on a bird early and my buddy killed one a couple hours later along the southern perimeter trail. We were a little dismayed to find corn in the crop of the turkey he killed. Our southern neighbor has been busted several times over the years for baiting turkeys, and it looks like he's back at it again. The game warden is aware of the situation so I'm hopeful he can put a stop to it. I was pleased to see that some of the rye strips we planted in an effort to keep some attractiveness to one of our heavily browsed soybean plots were doing quite well this spring. We're going full bore on the LC Mix this fall so I expect this plot to be a serious honeyhole this fall. 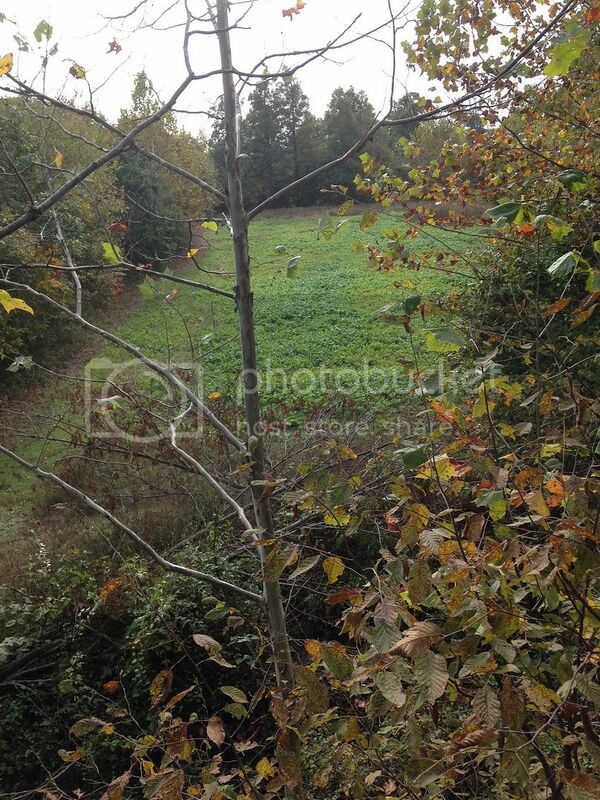 The only trouble I'm having is that there is supposed to be a treestand location on the far side of the plot in the picture. I'm going to have to get creative to make sure I have plenty of cover and don't get silhouetted when the sun sets behind me! I also got three chestnut seedlings from WBPDeer (thanks Wayne!) that I decided to plant at the edge of my 5 acre bean field. 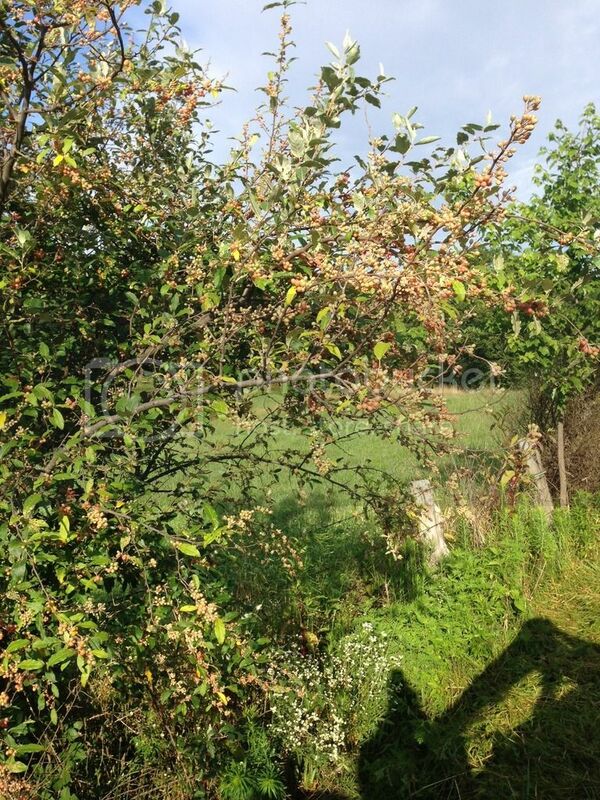 I already have a hedgerow set up to the left of the picture that is screening the field from the main access road. I figured adding some Chestnuts would help with food diversity and improve the screening in the future. My plan is to maintain a 15-ft buffer between the trees and the hedgerow that will be planted in clover. I got the bean field sprayed this weekend and plan to plant beans in 2 weeks based on my current schedule. Fingers crossed that the weather is good 2 weeks from now and that my schedule stays clear. The rest of the weekend was spent with my two hunting partners doing edge feathering around our food plots in accordance with Steve's plan. We're about 80% done with the edge feathering now, so I'm feeling pretty good about our preparation level for next season. On my previous trip to the farm, we got rained out before we could finish spreading all of the pelletized lime needed for all of the plots. Our two most difficult to reach plots on the powerline got 600lbs each of pel lime spread on them this past Saturday. Here is a pic from our south tower plot, which was planted in beans last summer, followed by frost seeding with white clover this spring. 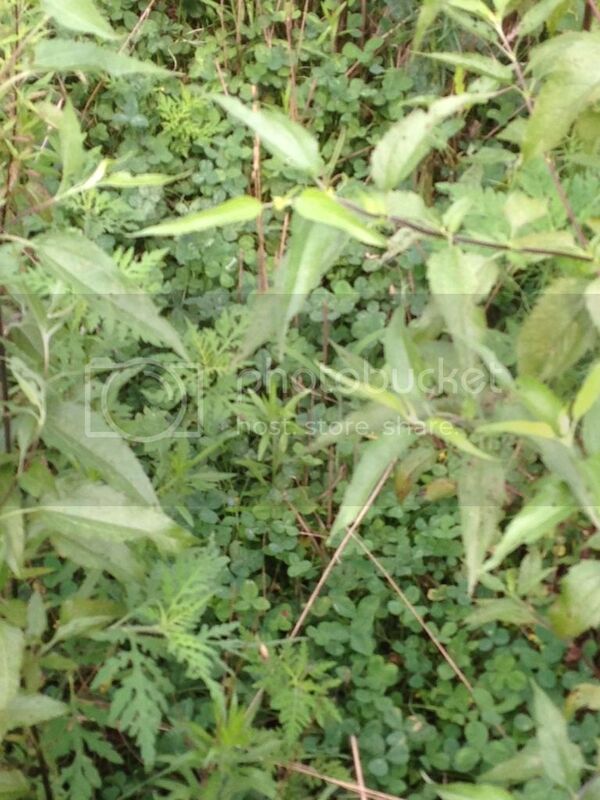 As you can see, I've got a lot of weeds coming up! I'm not worried about the weeds because this plot is slated for the LC mix this fall. I jumped deer out of this plot every time I walked through it during turkey season so there's obviously something they like to eat in there. Here's a pic from the south tower plot facing NE towards the center of the property. 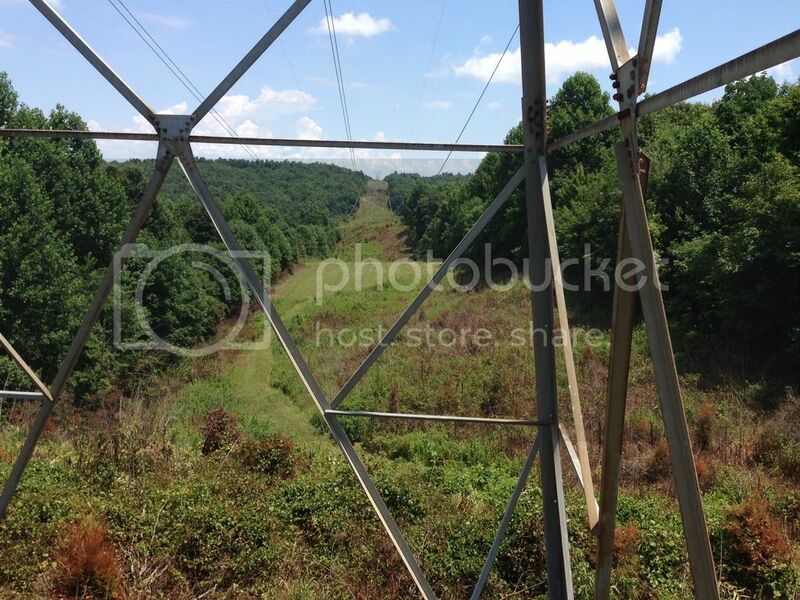 I spread 600lbs of lime on the bench down below the next power tower in the picture. 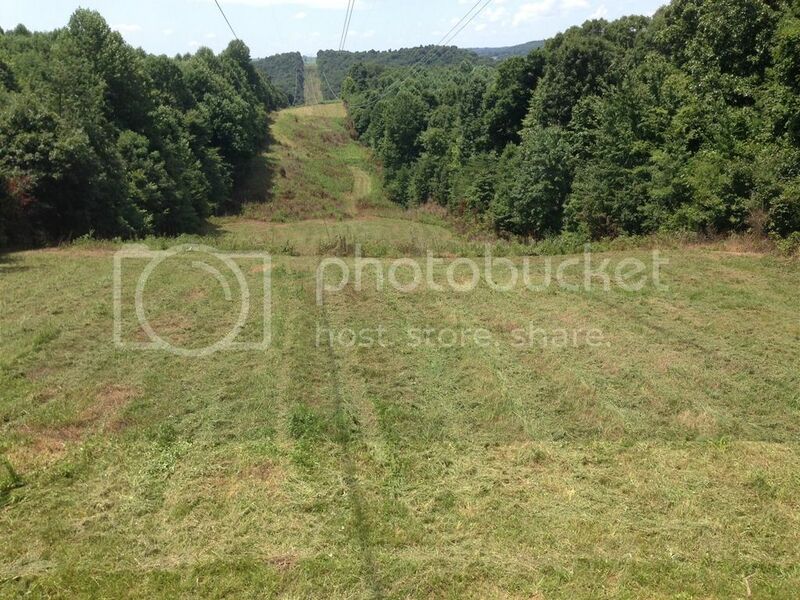 The plan this fall will be an LC mix on that bench as well as on top where the power tower is located. That tower is about as centrally located as it gets on my property. I'm hoping it's going to hold a lot of deer this fall and keep them from getting shot by the neighbors. 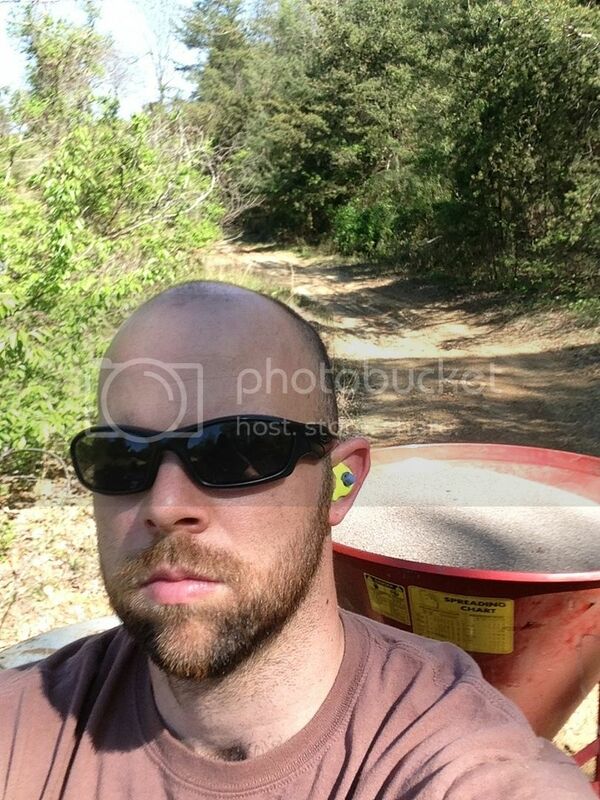 I broke away yesterday for a work day at the farm. Up at 3:15am and on the road by 4 with a 3.5 hr drive ahead of me. Two cups of coffee and 200 miles later, I rolled into the farm with a full day of work ahead of me. All of my upcoming plots needed to be mowed and sprayed. Ideally, I would have mowed them a few weeks ago and then come back through and sprayed them today after they had a chance to recover. Unfortunately, due to a broken hydraulic hose when my buddy tried mowing a few weeks ago, none of the plots had been mowed since spring. I have mowed and sprayed on the same day before and had pretty good results, so I'm optimistic. I'm planting LC mix, so I have another opportunity to spray before I plant the cereal grain mix around the end of August. The plan is to plant the brassica mix next weekend. 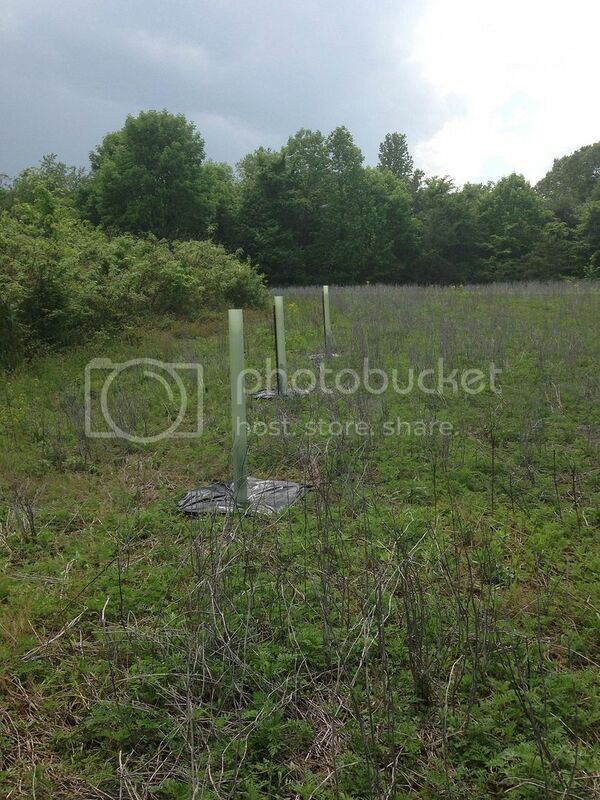 Here are some before and after pictures of the log yard plot. I frost-seeded clover into the winter rye this spring. The rye stand wasn't thick enough to suppress the weeds evidently, so I had 7-8' tall weeds to contend with. And the finished result (as my buddy is spraying it). The clump of weeds left standing is actually a watering hole. Next week, I will spread fertilize, incorporate/disc, cultipack, and seed the LC brassica mix into the left half of the plot, followed by cultipack again. 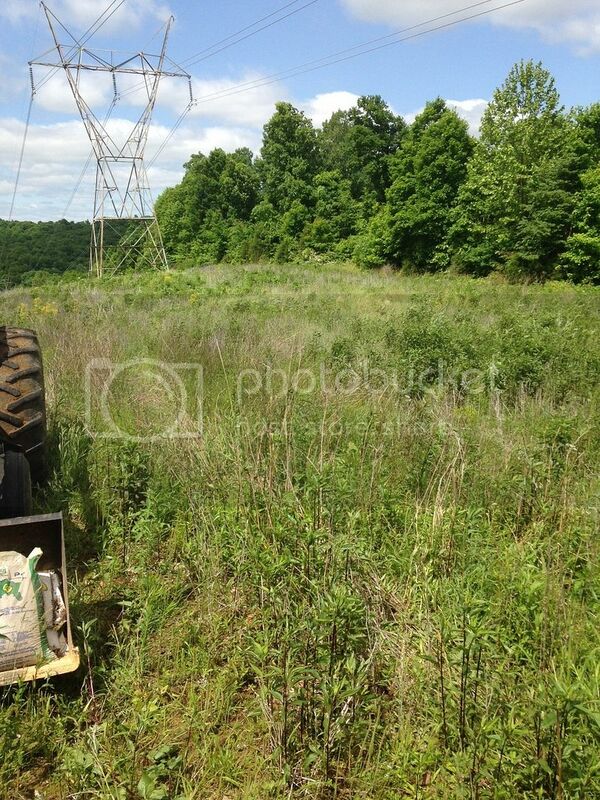 I went ahead and bush-hogged another spot to the north of the middle tower that I plan to plant winter rye and clover in late August to help build the soil. This plot can only be hunted with a rifle so I'm not going to go overboard with it knowing that i will most likely never hunt it this year. My bean field is looking decent (not nearly as nice as many other forum members') even though we missed a few spots with the post-emergent gly. Shout-out to WPDeer on my chestnuts! All 3 are looking great and have grown considerably this summer. 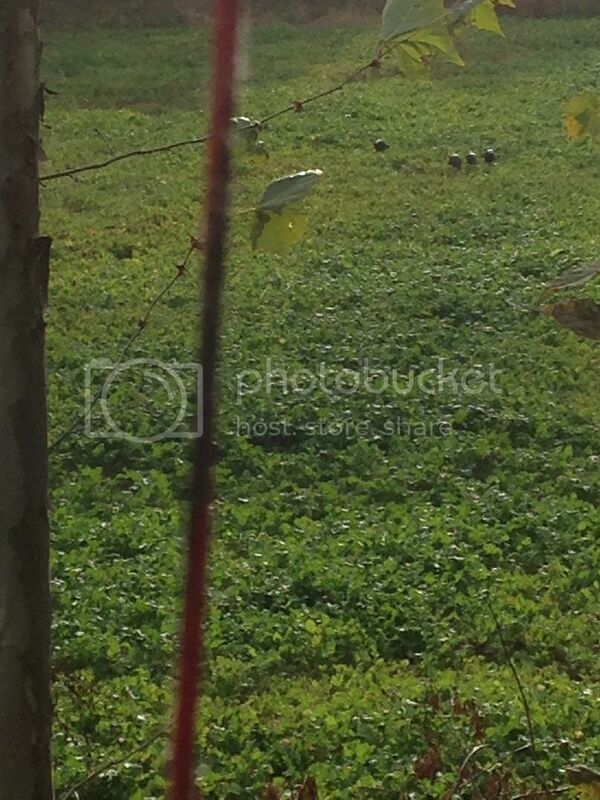 You can see them in the foreground of the bean field pic. Thanks again Wayne! Unfortunately, I found some more russian/autumn olives when I was bush-hogging. I plan to get after them with a backpack sprayer and a chainsaw next weekend. Locust and sumac trees are the predominant species in my overgrown fields, but I spotted probably a dozen of the autumn olives yesterday so I'm going to have to address them.